Krugman in fact takes position against the “conventional wisdom”, which has been widespread in academic and policy circles alike, that a link exists between financial and price stability; therefore the central bank can always keep in check financial instability by setting an appropriate inflation target. The global financial crisis is a clear example of the fallacy of this conventional wisdom, as financial instability built up in a period of great moderation. 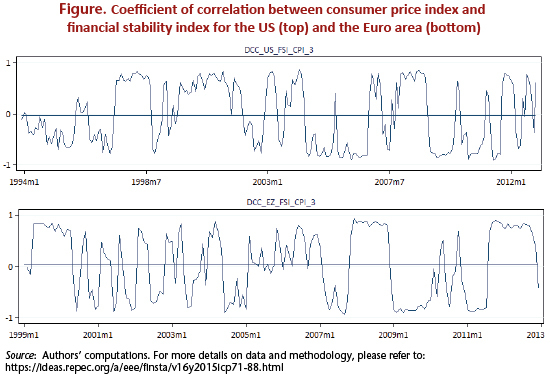 A recent analysis by Christophe Blot, Jérôme Creel, Paul Hubert, Fabien Labondance and Francesco Saraceno shows that the crisis is no exception, as over the past few decades, in the US and the Eurozone, the link between price and financial stability has been unclear and moreover unstable over time, as shown on the following figure. We therefore subscribe to Krugman’s view that financial stability should be targeted by combining macro- and micro-prudential policies, and that inflation targeting is largely insufficient. In another work, Christophe Blot, Jérôme Creel, Paul Hubert and Fabien Labondance argue that the ECB should be endowed with a triple mandate for financial and macroeconomic stability, along with price stability. They further argue that the ECB should be given the instruments to effectively pursue these three, sometimes conflicting objectives.